Let that sink in for a moment. American police are 300% more likely to kill themselves than be shot and killed by another individual. These statistics drive home the fact that the “war on cops” narrative is simplistic police propaganda, which utilizes the mainstream media as a mouthpiece in an effort to deliver the message to middle America. The stark reality is that were 47 cops shot in the line of duty in 2014 and this year the number is estimated to be even lower, projected at 43 shooting deaths if the current projections hold steady through the end of the year. While even one death is a tragedy, the reality is that now is one of the safest times to be a cop in the past 30 years. Over the past three decades, the number of police killings has decreased substantially, with 2015 being on pace to register even fewer deaths than last year, as well as fewer than the current decadal average. Contrast that with the 169 unarmed civilians killed so far this year by police or the 806 people reported killed by police in the U.S. in 2015, according to The Guardian’s database, although some of those deaths were likely justified self-defense. Instead of attempting to fix the glaring problems in policing, law enforcement has invested itself in attempting to distract and divide the public. With the help of mainstream media, they are attempting to portray themselves as victims of a rabid and out of control anti-police campaign which is violently and systematically targeting cops. If people really care about cops, then it’s incumbent upon them to focus on the true threats to officers’ lives and not just buy into the spin machine. The public must realize the dire situation, and extreme scope of the mental health epidemic currently facing law enforcement. There’s an extremely high rate of suicide, a domestic violence crisis and much higher rates of addiction in policing than the general public. It’s clear that the mental health issues affecting law enforcement should be a top priority if we hope to stem the number of citizens and cops being killed by police in America. People are tired of being killed by these cops. They operate with a gang-like mentality similar to the military, in that they are pawns in a larger game, but perceive themselves as warriors for a righteous cause. Cops often turn to suicide after they lose control of their personal lives. They are taught to be control freaks and to be always be in control and it often ends in tragedy. When I was a LAPD officer I had at least 6 partners and supervisors included who “ate” their guns. This police propaganda crap is occurring because they’re desperate and cops backs are up against the wall. They will resort to ANY tactic or issue and use it to inflate the situation. I perceive in the not so distant future some of these cowboy “John Wayne” types will instigate a fear driven attack against activists. This isn’t about ‘us vs. them,’ or attacking police; it’s about the necessity of purging a critical sickness from U.S. policing in an effort make the streets a safer place for citizens and police alike. One thing is apparent, as the data in the chart below show, there’s never been a time in US history when it’s been safer to be a US police officer than it is today. 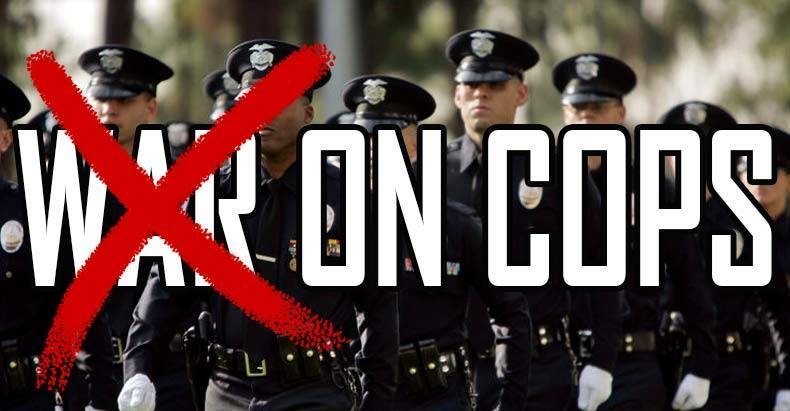 The “war on cops” is actually a propaganda war on the minds of Americans. It should be noted, however, that the police likely believe there actually is a “war” on them. If this type of propaganda continues without question, the end result could be horrid. Please share this article with your friends and family to show them the truth. Jay Syrmopoulos is an investigative journalist, free thinker, researcher, and ardent opponent of authoritarianism. He is currently a graduate student at University of Denver pursuing a masters in Global Affairs. Jay’s work has been published on BenSwann’s Truth in Media, Truth-Out, AlterNet, InfoWars, MintPressNews and many other sites. You can follow him on Twitter @sirmetropolis, on Facebook at Sir Metropolis and now on tsu.